In cooperation with the non-profit organisation PlaNet Finance SAP is involved in the shea value chain in Ghana since 2009. What started off as a project is now a functioning company in Ghana, which was drawn up as a social business according to Professor Muhammad Yunus. Why? What does SAP, the biggest global provider of business software, have to do with processing and trading shea nuts and butter? 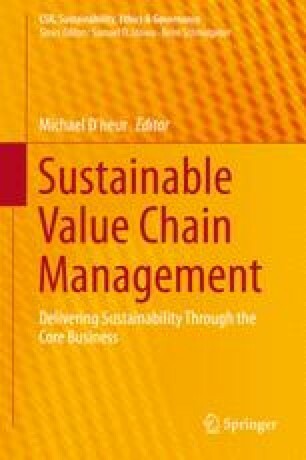 By drawing a connection between the company’s purpose and its sustainable business strategy, this article goes about to analyze this question. Innovations in SAP’s core business, deploying and improving the abilities of its own employees but also the SAP ecosystem play a significant role here. ADM. (2013). ADM cocoa confirms its commitment to improving livelihoods of farmers at World Cocoa Conference. ADM press release from Jan 8, 2013. http://www.adm.com/en-US/products/Cocoa/news_trends/_layouts/StoryDetail.aspx?ID=33&l=/en-US/products/Cocoa/. Accessed April 2, 2013. Dodson, L., Sterling, S. R., & Bennett, J. K. (2012). Considering failure. In Proceedings of the fifth international conference on information and communication technologies and development – ICTD’12, 56. New York, NY: ACM Press. doi: 10.1145/2160673.2160681. Global Reporting Initiative (GRI). (2013). Materiality in the context of the GRI reporting framework. https://www.globalreporting.org/reporting/guidelinesonline/TechnicalProtocol/Pages/MaterialityInTheContextOfTheGRIReportingFramework.aspx. Accessed April 2, 2013. Oxford. (2013). Greenwashing. http://oxforddictionaries.com/definition/english/greenwash. Accessed April 2, 2013. Planet Finance. (2013). L’expert de la microfinance. www.planetfinance.org. Zugegriffen April 2, 2013. SAP. (2009a). SAP increases focus on sustainable business. SAP press release from 2 March 2009. http://www.sap.com/corporate-en/press.epx?pressid=10988. Accessed April 2, 2013. SAP. (2009b). Digital inclusion. SAP sustainability report 2008. http://archive.sapsustainabilityreport.com/2008/priorities/digitalInclusion.html?sct=view. Accessed April 2, 2013. SAP. (2011). African Cashew Initiative helps small-scale farmers in Ghana through IT. In SAP Community Network. Published on 29 July 2011. http://scn.sap.com/community/research/blog/2011/07/29/african-cashew-initiative-helps-small-scale-farmers-in-ghana-through-it. Accessed April 2013. SAP. (2013). Integrierter Bericht 2012. Vision, Mission, und Strategie. http://www.sapintegratedreport.com/2012/unternehmensleistung/vision-mission-und-strategie.html. Accessed April 2, 2013. StarShea. (2013). www.starshea.com. Accessed April 2, 2013. UNDP. (2000). The millennium development goals – 8 goals for 2015. http://www.undp.org/content/undp/en/home/mdgoverview.html. Accessed April 2, 2013. Yunus Social Business. (2013). http://www.yunussb.com/. Accessed April 2, 2013.